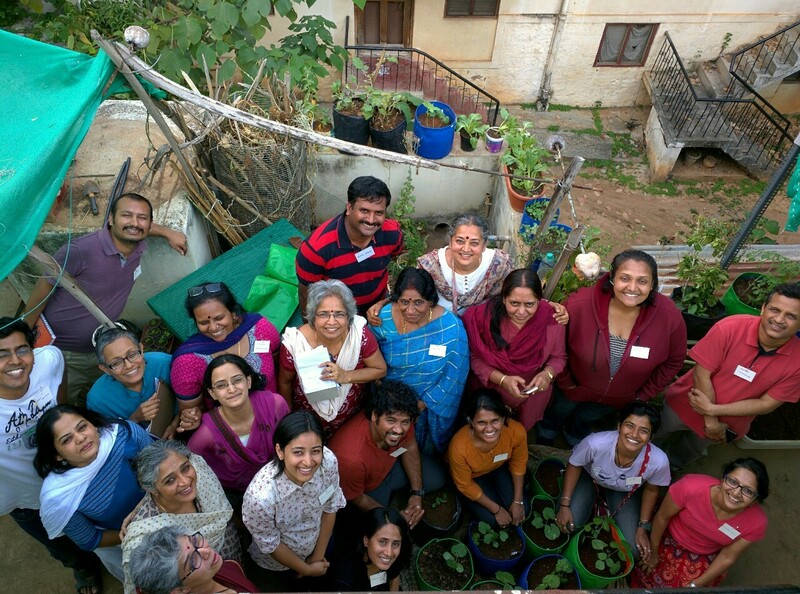 If you are into Organic Terrace Gardening and live in Bangalore, one of the names you’d hear very often is Vani Murthy. 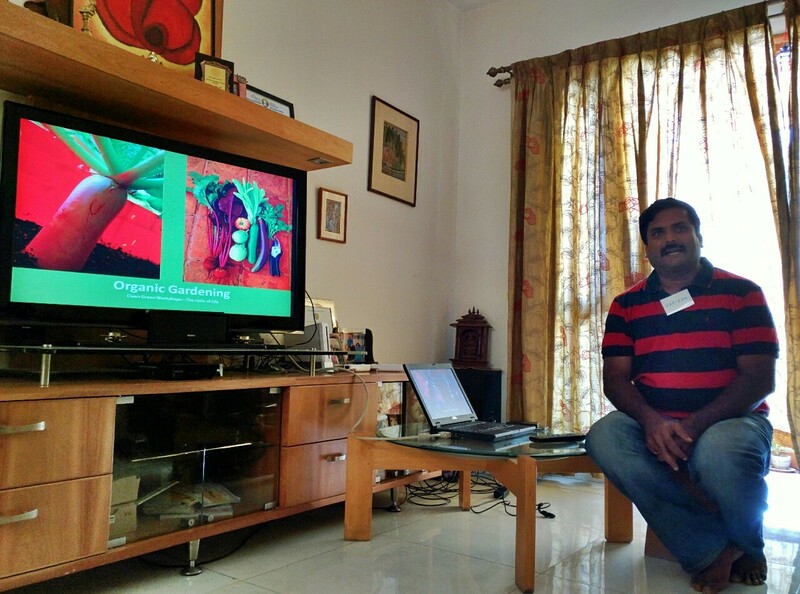 Vani is a treasure trove of information about composting and gardening. 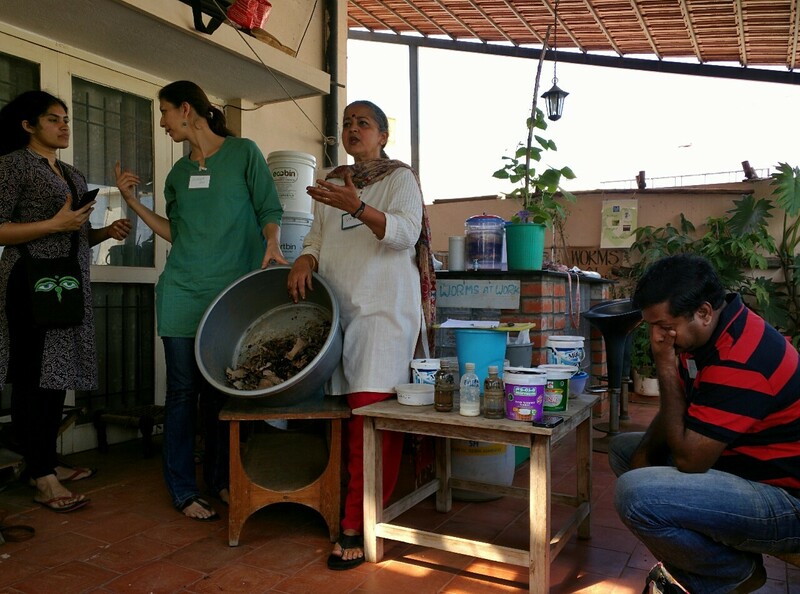 Vani started out with composting and garbage segregation a few years ago. It was the compost she made that led her to gardening. She is a compost queen, there is very little Vani doesn’t know or hasn’t tried in the arena of composting. I’ve been meaning to go for a workshop with her leading for a over a year now but something always comes up. This time when I got an email from the WCFM team, I scrambled to get things in place so I could attend. I didn’t want to miss out again. 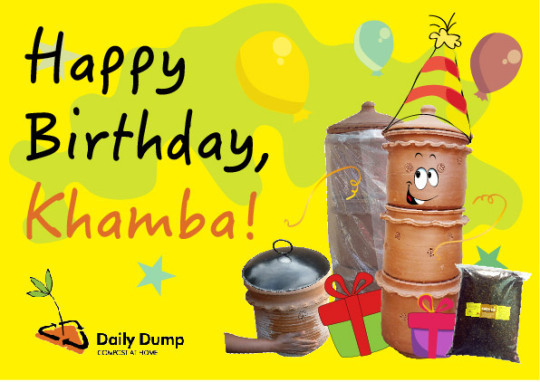 Of course I didn’t know that my khambha was turning one in the same week or that I had been composting for over a year. Quite a coincidence wouldn’t you say? 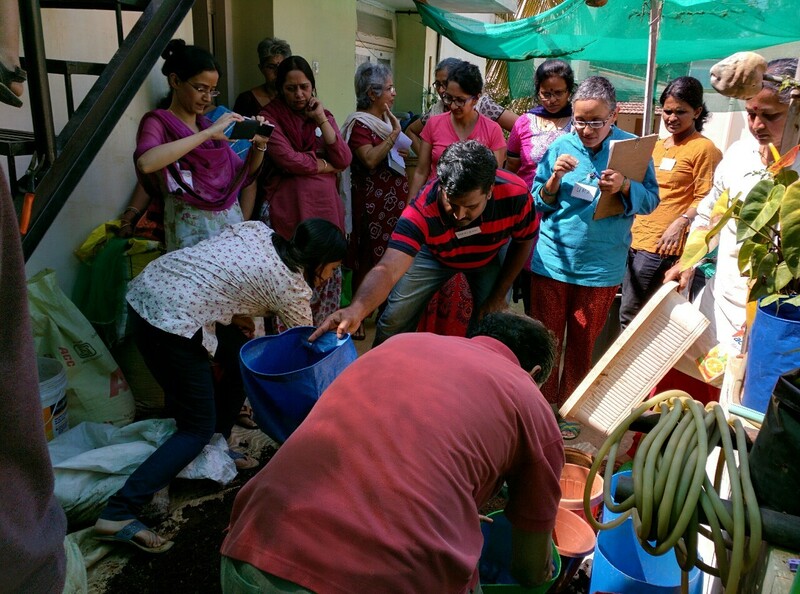 The workshop had sounded great, a session with Vai on composting and a session with Hariram on terrace gardening. That’s two fish on one hook! The workshop started with an introduction to garbage and it’s problem. 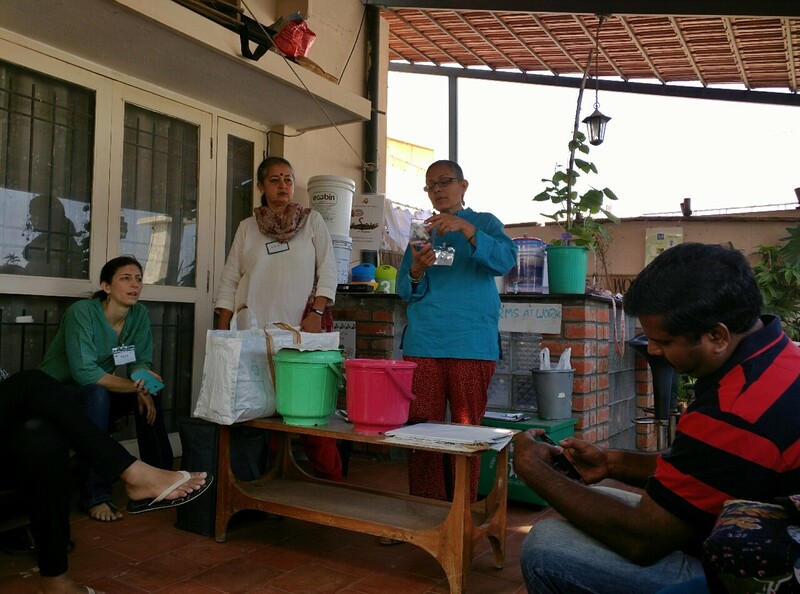 Uma, Claire, Vani and Shyamala walked us through the different types of garbage and how they can be managed and segregated. The stats are mind boggling when you realise how much waste we generate. And how much we can do by simply separating and sending the right junk to the right place. 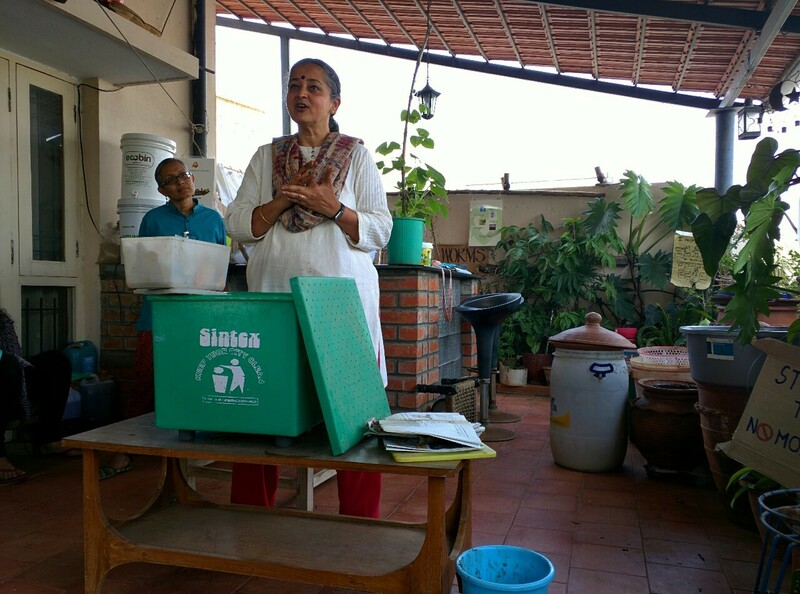 Now that we understood types of garbage, Vani took over on her speciality – wet waste. 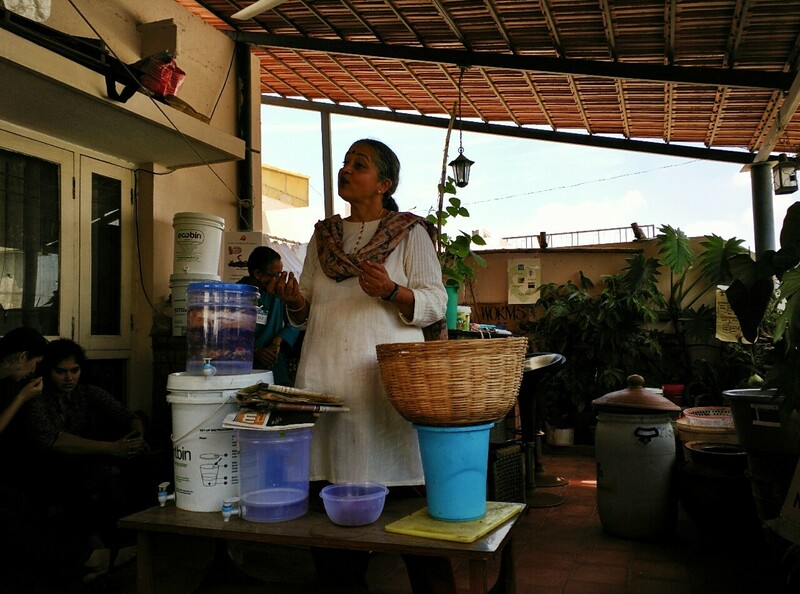 She started out with explaining what wet waste was and then delved into the aerobic method of composting. It’s process and do’s and don’ts. Vani then talked about the aerobic method, also called the bookish system and how it worked. This is a great method for indoor composting. This method also works better for meat and leftover food. And the leachate generated is an awesome payoff not only for plants but also drains! Then she got to what I have been wanting to know about for a while now. Earthworms! These little benign creatures can make for the fastest and best vermicompost. But they are also really delicate and fussy creatures. They need a lot of love and care! That completed Vani’s session and we headed down to for Hariram’s session which was to be both theory and practical. Harris started out with telling us about his background in gardening. He talked about how his grandma grew vegetables and how he outgrew the fascination of it as a child. But when his child commented one day that vegetables came from the fridge, he knew it was time to go back to the garden. He started out small with 3-4 pots and today has over 140 pots. Over the last couple of years he has grown and documented a variety of herbs and vegetables – from sweet potato to corn. After telling us about the types of soil, climate, sun, etc. Harris took a break for lunch. It was a simple wholesome lunch of bisibelabath and curd rice. This was followed up with the practical sessions. 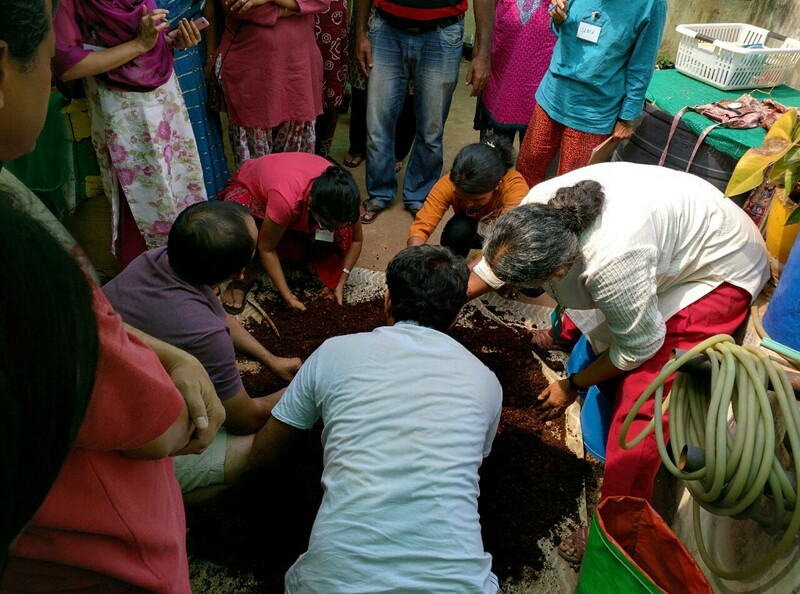 The first thing we got our hands dirty with was mixing and preparing soil. The bunch of us were split into groups and each group did one activity. 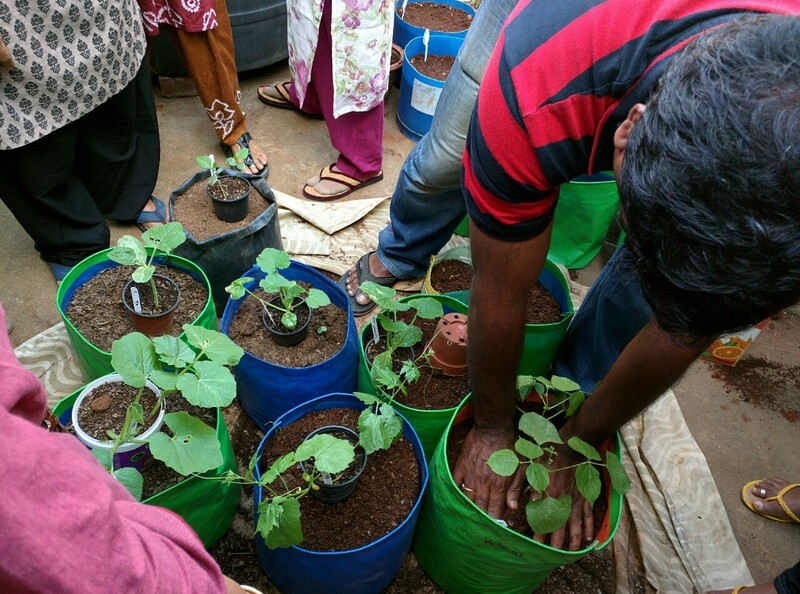 Group two got on their knees to filled pots and grow bags with the prepared soil. 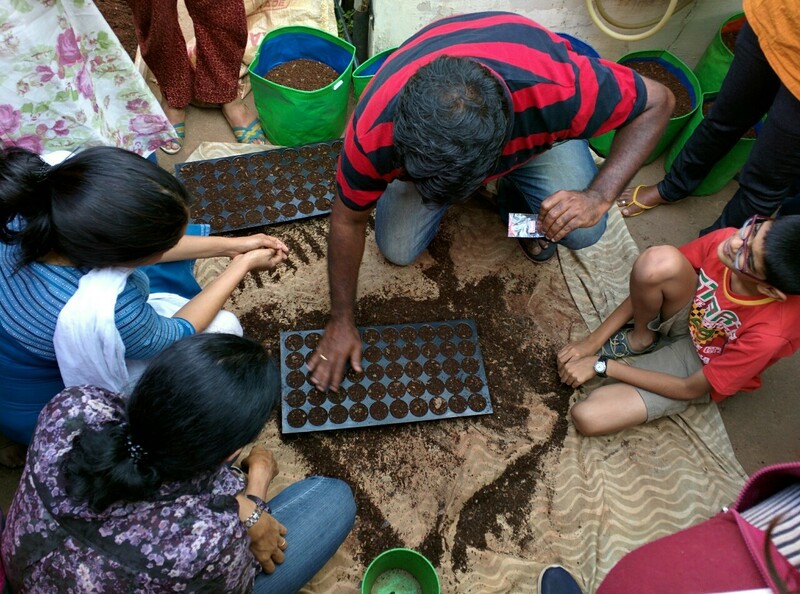 We then learned about planting seeds in seedling trays. How many seeds for what type of vegetable/herb and what depth. After that it was time to transplant saplings. 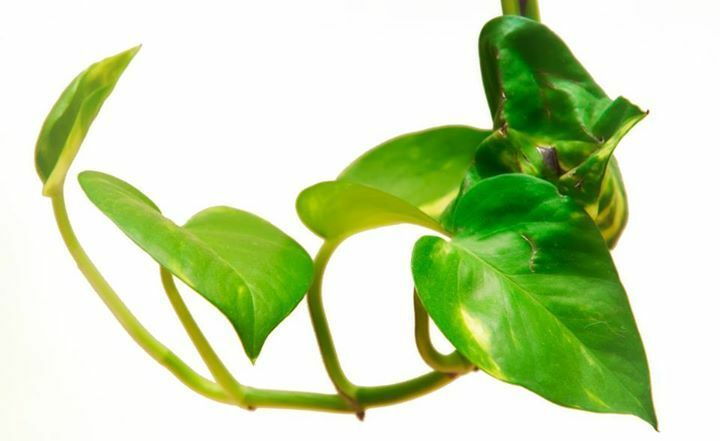 All the know how about removing and placing a little plant into a new pot. 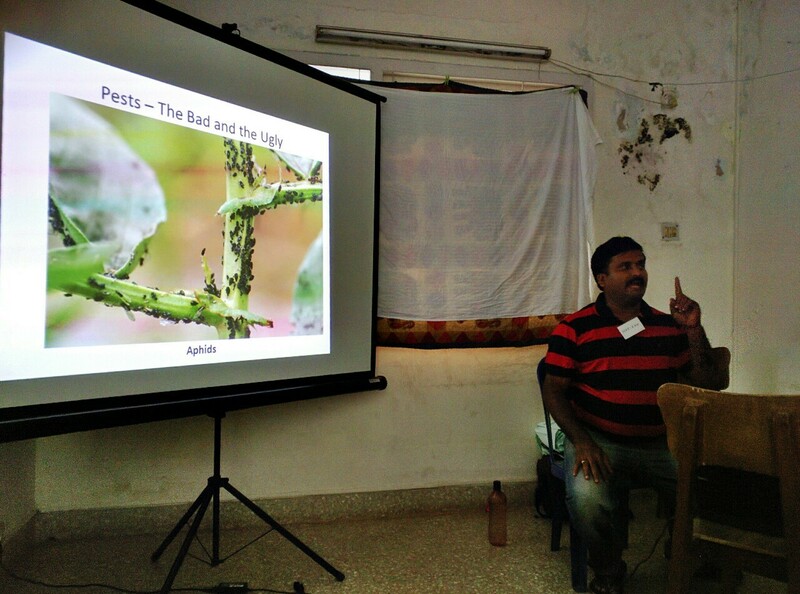 All the practicals complete, we headed back to the presentation to learn about crop rotation, pests and friendly insects. How to discourage pests with organic methods and tips on encouraging the good insects. And that completed our session. We’d exceeded the time limit and would have gone on I think, if we’d had a chance and choice. 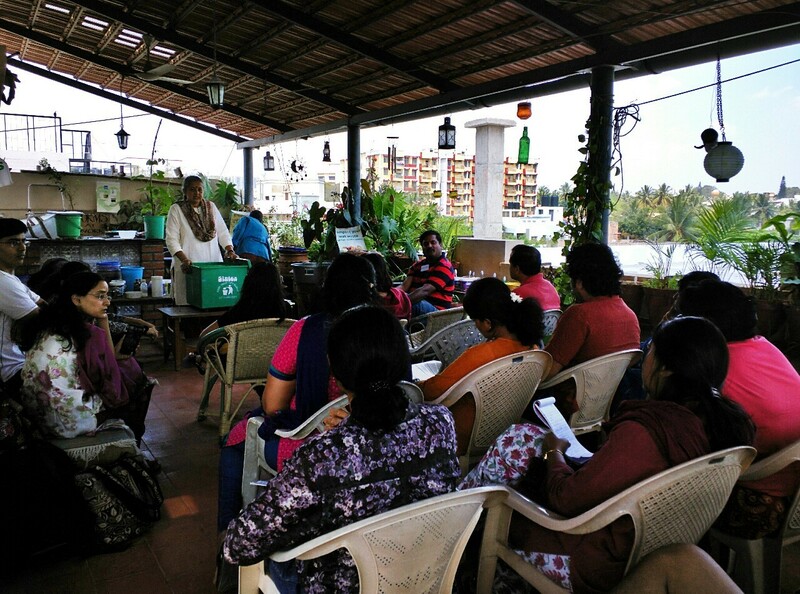 If you are into composting and/or gardening and would like to attend one of these workshops, please write in to cleangreenworkshops@gmail.com. Time flies quickly, maybe very quickly. I got reminded of this yesterday when I received an email from the DailyDump.org team. I know a year has gone past, it is now 2015 but I hadn’t noticed the time going by. I’ve completed a year of using the Khambha they said. That’s one year of not throwing any wet waste out of my house. That’s nearly a 100kg of waste kept away from a landfill according to the DailyDump guys. And that’s something to celebrate! Che and I don’t cook so much and yet we generate a fair bit of waste. I used to feel really guilty about this but after the Khambha came and I started composting I don’t feel so guilty anymore. At least not about wet waste and kitchen waste. All my kitchen waste like vegetable peels, vegetable discards, egg shells, bones, and even left over food goes into the composter and comes out as black gold. I must have made about 5 or so batches of compost until now and have used the compost too. The plants seem to love it and thrive on it. The whole cycle makes me smile and feel so satisfied. 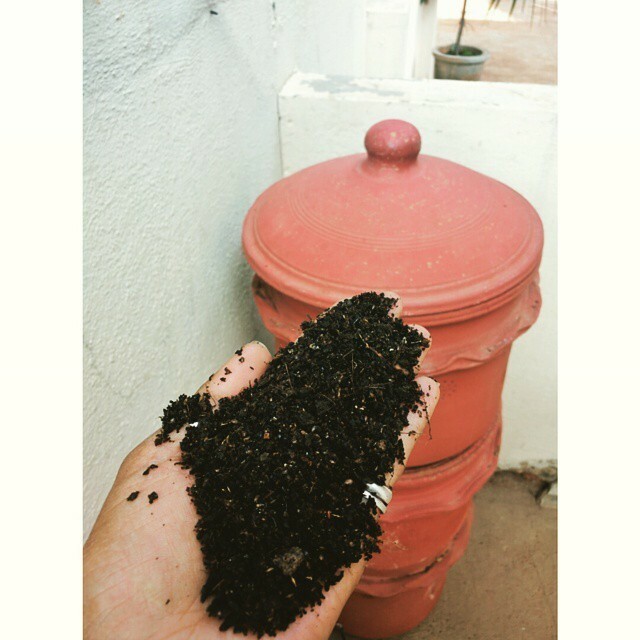 I’m giving back to nature in a way, becoming a part of a natural cycle and in the whole process I’m contributing less to landfills and my dustbin doesn’t smell anymore. I don’t care if the garbage collection guy doesn’t come daily for with only dry waste, there’s no smell or insects to worry about. 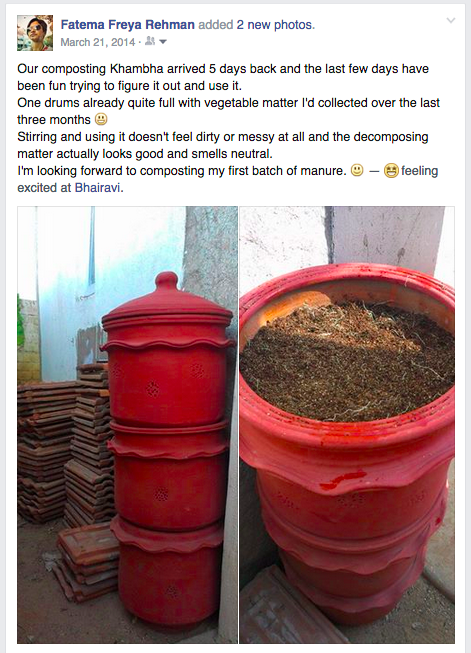 The process of composting itself isn’t very intensive. It’s simple to do, takes 5 – 10 minutes daily and maybe an hour or so once in a few months when the compost is ready. And even though all the veggie stuff you put in is decomposing, the compost while it’s getting done does not smell bad. I love the smell of my compost, it’s an earthy rich smell that fills me with joy every time I stick my nose in there. I started out with composting as gift to myself last year and what a gift it has been. Do you compost? Where did you get your composter? What’s your experience with composting? Last week was a blur of activity. 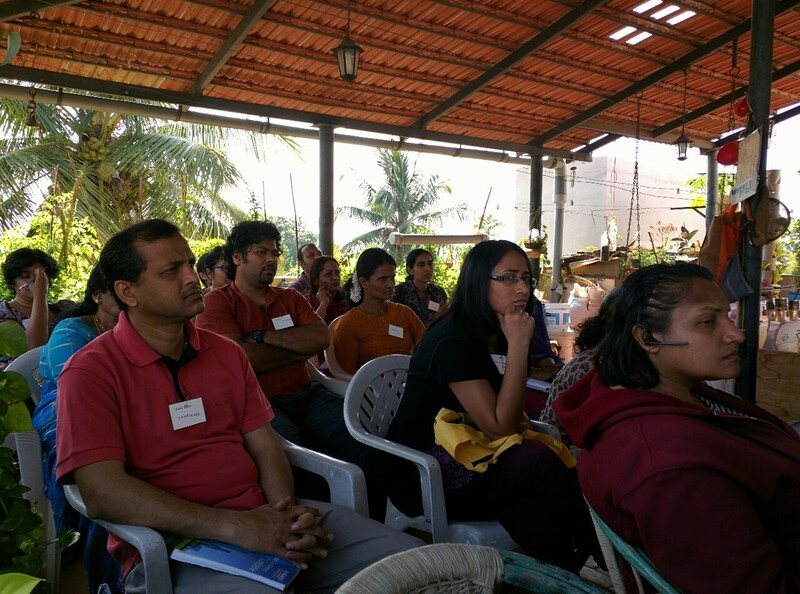 We started the week with Pascal coming to Bangalore. – In our family we have six dogs. Three with us, one with my Mom and Bro and two with my in-laws. Our long term plan is to keep all the dogs with us in a big place and this was our first step in this direction. Pascal came to Bangalore, got groomed thoroughly and got neutered too! He’s now being homed at Windward Kennels while going through re-hab and training to settle down in a all new place. As a child I loved the Golden my neighbour had – he was amazing. It’s going to be fun getting to know Pascal and having him around. Our latest TV hook is Revenge on StarWorld. We watched the first episode this Saturday and liked it. And as always with serials that we like, we don’t have patience to wait week on week so we downloaded and watched 6 episodes in a row. More to go today… Revenge is a story set in the Hamptons in the ‘upper class’. Amanda’s father had been wrongfully charged and punished when she was a child. She is now back as Emily Thorne to take revenge on all those involved and each episode is a new plot. In other news – I spent a lot of time browsing my feeds on Feedly this week. Should have a list of articles you may have missed for you to read tomorrow.